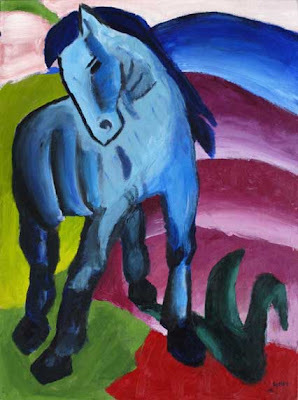 One of the astonishingly beautiful Blue Horse series of paintings by Franz Marc (1880-1916). Mystery animals come in all shapes, sizes - and shades. Certainly, the following hitherto-obscure example is a particularly dramatic case in point - one that could be aptly described as a horse of a different color, in every sense of the phrase! While in South Africa during 1860, a merchant by the name of Lashmar encountered a feeding herd of quaggas - those odd-looking relatives of zebras that were striped only on the front half of their body and which became extinct in 1883. As subsequently reported by C.O.G. Napier in the long-vanished English magazine Land and Water (February 22 1868), while observing them Lashmar suddenly spotted in their midst a strange-looking creature that was drastically dissimilar in appearance from the others, and discovered to his astonishment that it was not a quagga at all, but was instead a hairless blue horse! Once he had convinced himself that this ethereal entity was indeed real, he was quick to recognize its great worth as an outstanding novelty for exhibition purposes, and thus lost no time in successfully capturing it - after which he was able to study its extraordinary appearance closely, recording the following details. Its skin was smooth and delicate in texture, feeling to the touch like india-rubber, and very warm, and forming curious wrinkles when the animal moved - recalling to mind the more ornate, ostentatious creases and loose folds of skin sported by that increasingly popular breed of mastiff-related dog known as the shar-pei. Unlike the latter, however, the horse was wholly hairless, not even possessing any hair roots. In color, its skin was blue-mauve over most of its body, but with a buff face and a large patch of the same color extending over half of its back with numerous blotches. Its tail resembled that of a pig. In overall appearance and when seen at a distance, this singular steed looked as if it had been sculpted from some rare variety of oriental blue marble. After capturing it, Lashmar sent it to South Africa's Cape Colony, from where it was brought over to England in 1863. There, it was broken in at Astley's, and ridden for three parts of the season with Lord Stamford's hounds. It was also examined by Professor Spooner of the Veterinary College, London, who delivered a lecture concerning its unique appearance to his students. Purchased by a MrÁMoffat, in February 1868 it was exhibited in London's famous Crystal Palace, but its original blue coloration had been gradually fading ever since its capture, transforming into a rather more nondescript isabelline-grey. According to Moffat, the horse stood 14.2 hands high (i.e. just under five feet tall), was symmetrically shaped, and performed well in harness, but required warm clothing on account of its hairless nature. Moffat washed it each day, to keep it in good health. Since its Crystal Palace days, nothing more seems to have been documented regarding this strange animal - its ultimate fate, therefore, is unknown, and prior to this present account its very existence had long since been forgotten. As an inevitable consequence of its many decades of obscurity, the reason for its bizarre appearance has never been explained. However, the creature with which it seems to correspond most closely with regard to its curious skin is the Chinese crested dog - a superficially chihuahua-like breed that is without hair over much of its body, and which has portions of blue skin coloration. This breed's hairless state is caused by the possession of a mutant form of one of the genes controlling hair development, whereas its blue shading arises via the presence of the pigment eumelanin in its skin. 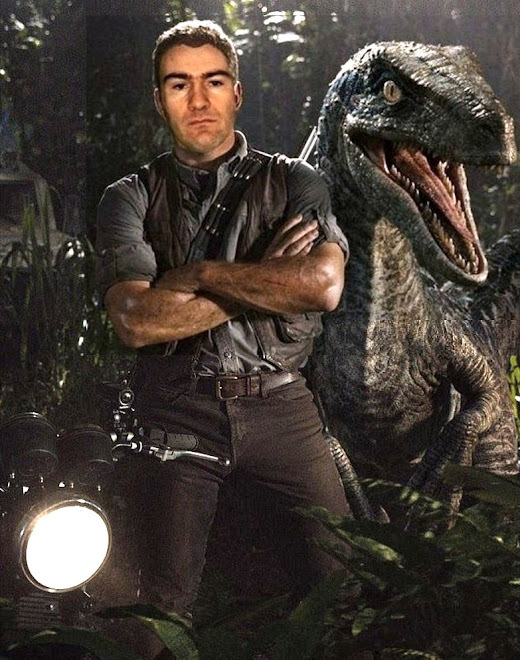 Comparable conditions in a horse could yield the type of specimen captured by Lashmar. "I have a colonial-bred mare that is a very light blue; that is, she is nearly white, with the exception of mane, tail, and legs, which are bluish, and a black star on her forehead. The mare is about 7 years old now, and was born with this black star. It is the only case I have ever seen or heard of." Freakish blue animals have occasionally been reported from other mammalian species, notably various wild cats - with pelts of blue lynxes and bobcats occasionally obtained by the fur trade. In southeastern China's Fujian Province, an elusive strain of blue-furred tiger allegedly existed at one time (and may still do so today). During September 1910, the renowned Methodist missionary Harry Caldwell actually encountered one of these extraordinary creatures at close range, and attempted to shoot it to provide unequivocal proof of its reality - but was unable to do so because of the possibility that he might have injured two children collecting vegetation a little further away, who were in direct line of his planned shot. And an exotic white cheetah with remarkable blue spots was once brought to the Mogul naturalist Jahangir at Agra. Nevertheless, the mystery of Lashmar's blue horse remains unsolved - and not only on account of its color and hairlessness. There is one final anomaly that seems never to have attracted attention even during this animal's brief period of celebrity status. Namely, how can we possibly explain its presence amid a herd of quaggas? Where had such a bizarre beast originally come from, and why was it now associating with a herd of creatures belonging to a wild species only distantly related to its own? Is it even conceivable that this abnormal creature was not a domestic horse at all, but was in reality a freakish mutant specimen of quagga - a sport of nature set apart from its brethren morphologically, but nevertheless recognized by them as being one of their own kind and hence permitted to feed and associate with them? Who can say? Just like the quaggas that were themselves destined to be lost forever, there is little doubt that the secret of this strangest of all steeds died with its originator - yet another mystery beast to be reported, recorded, and afterwards conveniently forgotten like so many before, and so many since. Excerpted from my book From Flying Toads To Snakes With Wings (Llewellyn: St Paul, 1997. Yes, I do enjoy the occasional alliteration! But seriously: in a recent ShukerNature blog entry, I documented a selection of reports suggesting the possible survival into recent history of various giant lemurs on Madagascar. However, these are not the only cryptozoological mammals on record from this Indian Ocean island mini-continent, as demonstrated by the following pair of enigmas. Also known as the tsomgomby, lalomena, or railalomena, the kilopilopitsofy is an unidentified beast spoken of by the Belo-sur-mer villagers to scientists Dr David A. Burney and Ramilisonina during their ethnographical researches on Madagascar in the mid-1990s. As with a mystery lemur called the kidoky (see my earlier blog), they received consistent reports of this mystery animal from several different eyewitnesses, including, once again, Jean Noelson Pascou, who was able to describe the kilopilopitsofy in considerable detail, following his own sightings of it, one of which was made as recently as 1976. According to Pascou, it is cow-sized but hornless, has very dark skin, pink colouration around its eyes and mouth, fairly large floppy ears, big teeth, large flat feet, is nocturnal, and escapes from danger by running into the water. 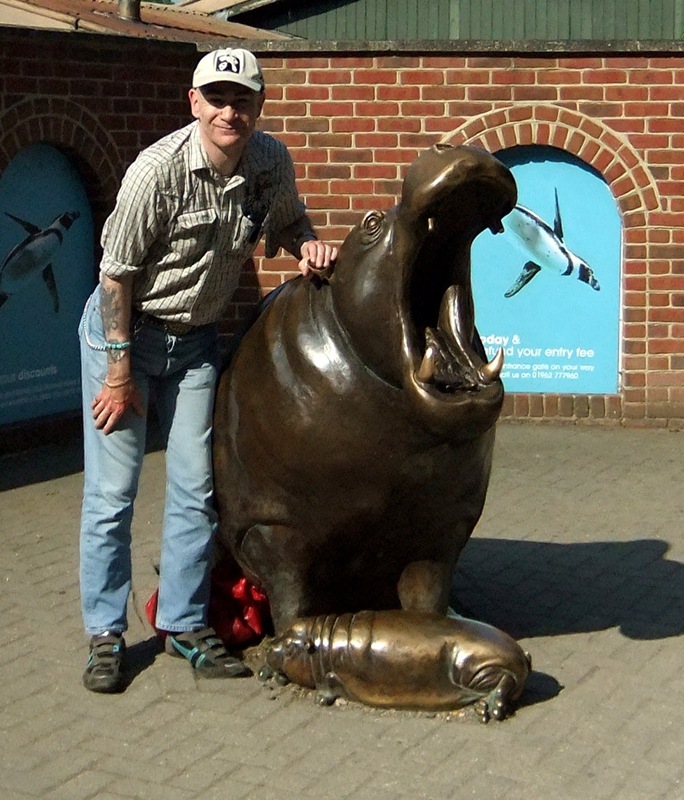 When shown photos of various animals, another kilopilopitsofy eyewitness selected a hippopotamus as bearing the closest resemblance to the kilopilopitsofy. Moreover, when asked to describe the sounds that the latter mystery beast makes, Pascou, who was well known in the village as a skilled imitator of local animal noises, gave voice to a series of deep, drawn-out grunts, which the startled scientists realised were very similar to the sounds made by the common African mainland hippopotamus. Yet no species of hippopotamus is supposed to exist on Madagascar – or not any longer, that is. In fact, living alongside the giant lemurs on Madagascar were once no less than three different species of endemic Malagasy hippopotamus. These were: the lesser Malagasy hippo Hippopotamus laloumena (a small relative of the common African mainland species, H. amphibius); the Malagasy dwarf hippo H. lemerlei (an even smaller, dwarf species); and the Malagasy pygmy hippo Hexaprotodon madagascariensis (a distinctive pint-sized species more closely related to the African mainland pygmy hippo). 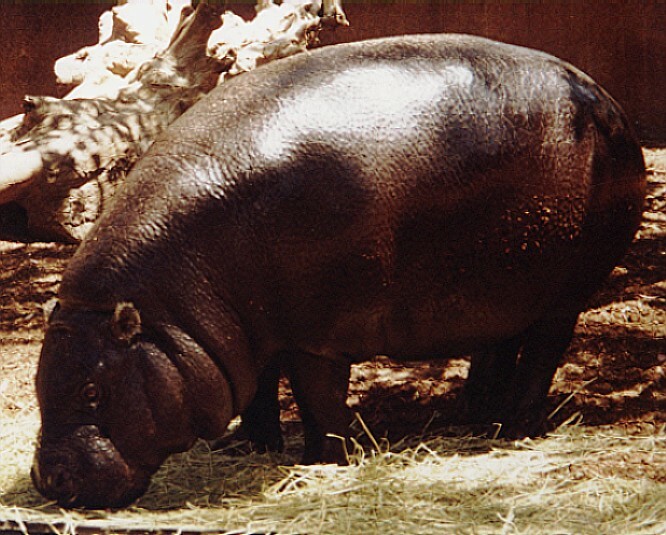 Just like the giant lemurs finally became extinct, however, so too did all three Madagascan hippo species, once again having been hunted and eaten by humans, but with subfossil evidence confirming that at least one species, the Malagasy dwarf hippo H. lemerlei, was still alive as recently as 1000 BP. Furthermore, judging from the testimony of Pascou and others with regard to the mystifying kilopilopitsofy, zoologists as well as cryptozoologists now consider it plausible that at least one of Madagascar’s diminutive trio of hippos actually persisted into much more recent times, and perhaps even into the present day. As for this mystery beast’s floppy ears, they deem it possible that these were actually loose jowls and cheeks, misidentified as ears when seen fleetingly at night. Alternatively, it may be that they really are ears, larger than those of typical hippos, which have evolved to help dissipate heat if, as seems to be the case, the dwarf hippo in particular was (or is?) more terrestrial than typical hippos. 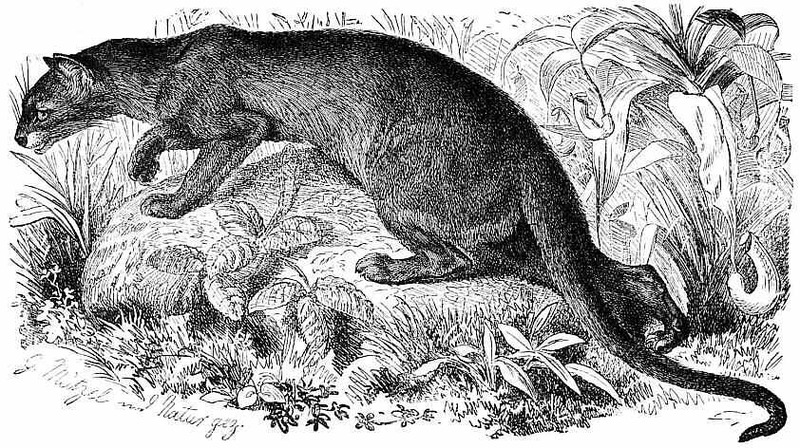 In 1876, the skin of an alleged tsomgomby was actually shown to Westerner Josef-Peter Audebert, who likened it to that of an antelope (no species of which exists on Madagascar), and stated that it had supposedly come from the south of the island. If only this skin had been preserved – DNA analyses would have unmasked its owner’s identity and, perhaps, finally resolved the longstanding mystery of this very perplexing Madagascan cryptid. The Madagascar antamba is an animal as large as a dog, with a round head, and, according to the relations of the Negroes, resembling the leopard. It devours both men and cattle, and is only found in the most desert[ed] parts of the island. In November 1999, fossa expert Luke Dollar, intrigued by persistent rumours concerning the antamba, trekked in search of it through northeastern Madagascar’s Zahamena National Park, also known as the Impenetrable Forest, and said to harbour this elusive beast. Unfortunately, he did not sight it, but has not given up hope that it does exist, as most of this uninviting region has never been scientifically explored. Also worth noting is that, although once again still-unconfirmed by science, there have been a number of reports of melanistic (all-black) fossas in certain eastern rainforest areas of Madagascar.